A warm welcome to regular Flower of the Month contributor, Susan Ernst. 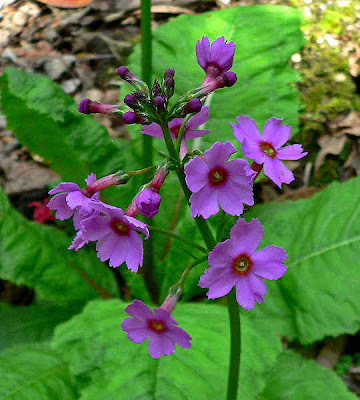 Primula as a genus or plant group, has over 500 species and are classified and arranged into various groups. Information on these classifications can be found starting here. We will take a look at those most common and familiar. 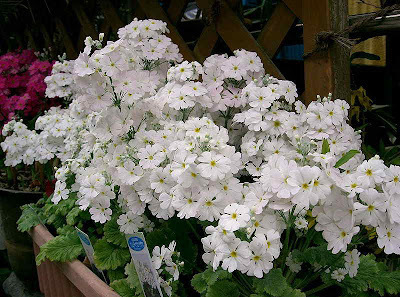 The English Primrose, Primula vulgaris (Latin for “first one” and “abundant or common”, respectively), has been the quintessential harbinger of spring in Britain, as evidenced in the writings of Milton, Shakespeare and numerous other writers of the 17th, 18th and 19th centuries. The leaves of this plant, and all Primulas, grow in a basal rosette, meaning a cluster of leaves growing in a circle which remain close to the ground. The leaves are a light, fresh “spring green” color and are crinkled. The fragrant, pale yellow flowers rise singly on long stems. Purple and blue variations can sometimes be found growing wild. As a flower of early spring, it is not surprising that in the Victorian Language of Flowers, primroses represented early youth and young love. It was said that if a young woman were to come across a primrose before Easter, while out in the fields, she would be married that year. In Catholic symbolism the primrose is a flower of mercy and compassion. If a sinner passed one by, the primrose would assist him and save his soul. The Cowslip, Primula veris (Latin for “first of spring”), also mentioned by Shakespeare, bears clusters of small yellow blossoms held on a central stem above the rosette of crinkly bright green leaves. 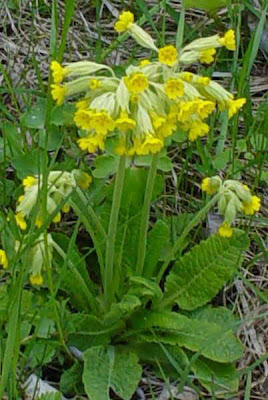 The primrose (including cowslip) was used medicinally through the centuries to treat several ailments, including as a sedative and to “strengthen the nerves.” It was used as a tonic for the complexion. In the kitchen, wine has been made from the flowers. Flowers are also candied and used to decorate cakes. The flowers may be brewed into a tea or can be eaten fresh with cream. The leaves are added fresh to salads or boiled as a potherb. 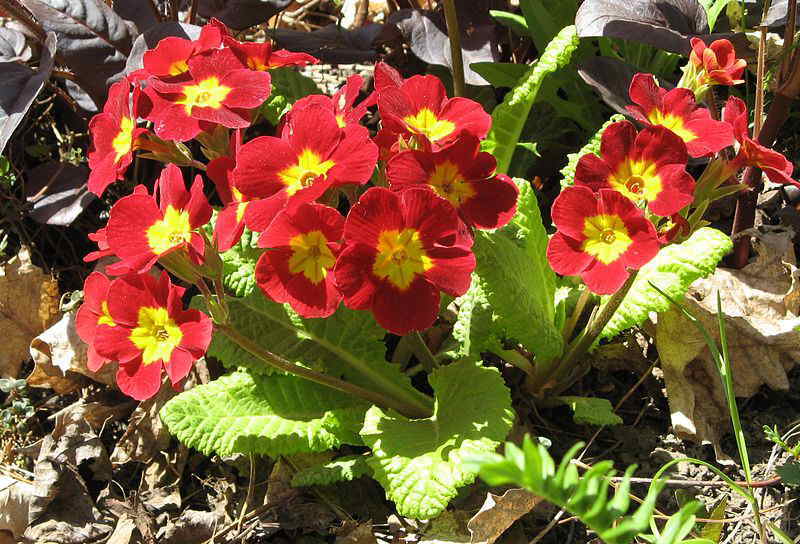 P. polyanthus – brightly colored flowers of pinks, blues, red, white and golds with a yellow center. These are the primroses most often seen in the United States. P. auricula – available in many colors with a contrasting center. The leaves are evergreen. This variety was very popular during the Victorian era. P. japonica – this variety produces very tall stems holding large clusters of white, pink, crimson and purple flowers. P. malacoides – Fairy Primrose – grown as an annual or potted plant, the small flowers in clusters on tall stems are available in pastel shades of pink, lavender and white. Primroses grow best in rich moist soil in partial shade.